Plot: A pair of friends embark on a mission to reunite their pal with the woman he was going to marry. Starring: Adam Pally, T.J. Miller, Thomas Middleditch, Shannon Woodward. 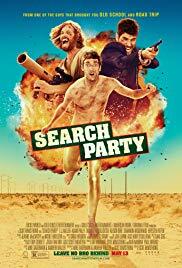 distributed by Focus World «Search Party» in the US movie theaters released on May 13, 2016 and has grossed over $5k worldwide; dvd and blu-ray release date was set for July 5, 2016. Rent from Netflix and Redbox from July 5, 2016. «Search Party» in the UK released in movie theaters on May 29, 2015. The movie released on dvd and blu-ray on October 12, 2015.